MacLellan reeds are designed and manufactured to be the freest, most vibrant reeds in the world. The individual attention and custom finish of each reed ensures that optimum pitch and trueness of tone are achieved without protracted blowing in periods and only a short session of adjustment is needed to set up a true and rich tone from your bagpipe. The MacLellan reed requires no more set up skill than the ability to squeeze the centre of the reed blades when initially setting in the pipe chanter. The reeds have been designed so that squeezing is the only adjustment required. The reeds will take a large amount of this pressure and so gradually the piper will be able to set himself or herself just the right strength of reed from the outset. Each MacLellan reed is supplied in its own airtight, labelled tube container. The reeds come in strong, medium, easy, and our special “senior’s strength” which is almost resistant-free reed which is extremely easy to blow yet maintains a balanced full tone. This reed is suited especially to older players, and to those who are starting to play the pipes, and to inexperienced pipe bands. The reeds are suited to any make of pipe chanter but are tested three times in MacCallum, Naill, and Kron chanters before dispatch.As the MacLellan reeds are played, they will naturally take on moisture from the air being blown, and this will result in the tone “filling out” and becoming louder and rounder. It may be that after the initial play, the piper may find that the next time that the reed is played it has become stronger; this is perfectly normal and all that is required to bring it back to an optimal state is to squeeze it in the centre of the blades. A little experience will help in indicating to the piper how hard or soft and how long to hold the squeeze. MacLellan reeds are custom made to suit each customer, it will not be necessary to make large incremental adjustments to the reeds. When an order is received, the reeds are individually finished and pitched to each customer’s specification; there is no such thing as a stock of MacLellan reeds waiting for customers. The reeds are manufactured in such a way that after an order is received, it will be finished and completed to suit the customer from a stock of unfinished reeds which have been recently tied. As a result of the manufacturing process and of careful testing and customer control, each MacLellan reed is guaranteed to be free and vibrant and to produce a balanced scale. Maintenance and adjustment are minimal, and our aim is to be able to come as close as is possible to achieving a “plug and play” product. Initially it is vital that the appropriate strength of MacLellan reed is selected. The piper will know what strength suits his or her style of blowing. The reeds will not change in strength during the initial playing period. Take the MacLellan reed and set it in the pipe chanter. It should sit approximately half or two thirds the way down in the reed seat in most chanters. At this point the piper when blowing the reed in the mouth will listen to the scale interval between Low A and High A. An accurate octave is required between those two notes and the piper can raise or lower the reed in the reed seat until the High A achieves a perfect octave in relation to the Low A. A simple point worth noting is of course that when the reed is lowered in the reed seat the High A becomes sharper, and when raised in the seat the High A becomes flatter. The relation in adjustments between top and bottom hands are exponential; for instance as the reed is lowered in the reed seat the High A will become relatively much sharper than the corresponding difference in the Low A, indeed many pipers will not notice a difference to the ear in the pitch of the Low A even if the reed is lowered substantially. They will however notice a dramatic and obvious difference in the High A! If the pipe chanter is a good one, the piper will notice that the scale intervals of each note should be fairly true at this stage. The ideal situation of course is that once the Low A to High A octave has been set, then the rest of the notes on the chanter will also be true and no other adjustments will be necessary. It is an extremely rare occurrence for this to happen, however, and invariably some of the other notes may be slightly sharp or slightly flat. Often notes such as the C or the E will initially be slightly flat, and as the reed gains fullness of tone in the first playing these notes will naturally become true; notes which are initially sharp may be brought into true by applying a small strip of self adhesive tape to the top of the hole of the note. This has the effect of moving the centre of the hole farther down and away from the bottom of the pipe canter reed; as this air column is lengthened, the note becomes flatter in pitch. Some expert pipers will undercut the top edge of certain holes of the chanter in order to correct notes which have been found to be consistently flat with a good variety of different reeds; this should only be undertaken as a very last resort. Far too often we find cases of the chanter being made to fit the reed, and not the other way round. Many excellent chanters have been ruined by indiscriminate drilling and carving by inexperienced hands! It may be the case that the piper may want to weaken the pipe chanter reed, although the recommended course of action is to choose the MacLellan reed strength which suits best. However, experienced pipers may wish to make very fine adjustments and the recommended method of weakening adjustment to the reeds is to take a small square of fine glass paper (600grit) and fold it over a sharp table edge. Take the reed and rub up and down at 45 degree angle the same part of the centre of the blades as you would squeeze; take a little off at a time in equal amounts off each blade and then mouth blow for strength until the desired level or resistance is achieved. Do not sand the blades flat on the table top; the blades and corners are extremely fine at those points and you will spoil the body and tone of the reed if those areas are altered. If the reed needs to be strengthened slightly, use a shaped mandrel to very gently push up into the staple of the reed thus opening the mouth of the blades. 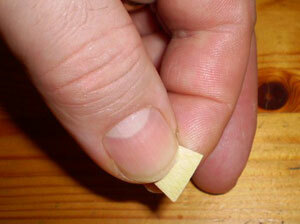 Only slight pressure is needed here and a little adjustment will make the reed stronger and slightly flatter in pitch. 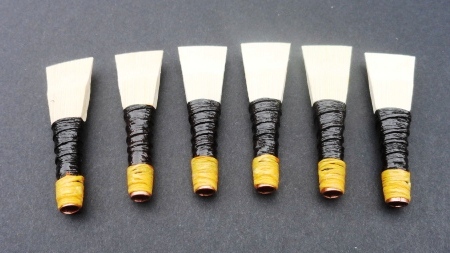 If the reed needs to be sharpened slightly, cut off as little as possible off the tops of the blades with wood block and sharp chisel; experience is important here and when the blades are shortened in this manner the reed will become sharper, especially on the top hand notes, and stronger.